A Day Late and A Dollar Short: Red Robin - Purchase a LE Red Robin Gift Card, Snag a **FREE** Movie Admission! 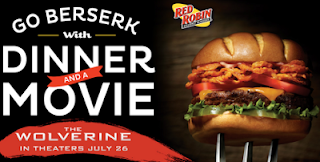 Red Robin - Purchase a LE Red Robin Gift Card, Snag a **FREE** Movie Admission! Visit the Red Robin website to purchase a limited edition Wolverine gift card of at least $25, and you can snag a code to see the new movie, "Wolverine" coming out this summer!